Camryn Scully has had some tough choices to make recently, and the 17-year-old Métis athlete, who loves to play both fastball and hockey, has decided to pursue her academic and athletic pursuits this coming school year at the University of Calgary. Scully, who is finishing off her Grade 12 studies at Prince George Secondary School, has opted to quit playing hockey so she can concentrate on her fastball endeavors while at university. Scully had an opportunity to continue playing hockey had she chosen to attend Alberta’s Red Deer College. but she chose the University of Calgary because of the solid reputation of the Kinesiology program at the school. “It’s the Number 1 Kinesiology program in North America,” she said. Scully could have continued to play both hockey and fastball. That’s because an Illinois-based school—McKendree University—was keen to have her play both sports at its school. The University of Calgary is about an eight-hour drive from her home. Scully anticipates her parents Angela and Corey will occasionally make that trek to see her perform in the university ranks. Scully decided to commit to Calgary after visiting the school two weeks ago. While there she also had a pair of indoor practice sessions with the women’s fastball team. Scully was also pleased to receive encouraging words from Neal Harlos, the head coach for the Calgary Dinos’ squad. “He told me I was a great fit for this team,” she said. Scully has already displayed her commitment to the sport. At age 10 she started playing in her local association, Prince George Minor Girls Softball. For the 2018 season, she moved away from home to play a more competitive level with the Coquitlam Classics under-19 squad. In order to play for the Classics, Scully had to complete her Grade 11 studies online. And she was billeted with a family in Coquitlam from April through July. Classics’ coach Jay Lang praised Scully’s efforts with his team in 2018. 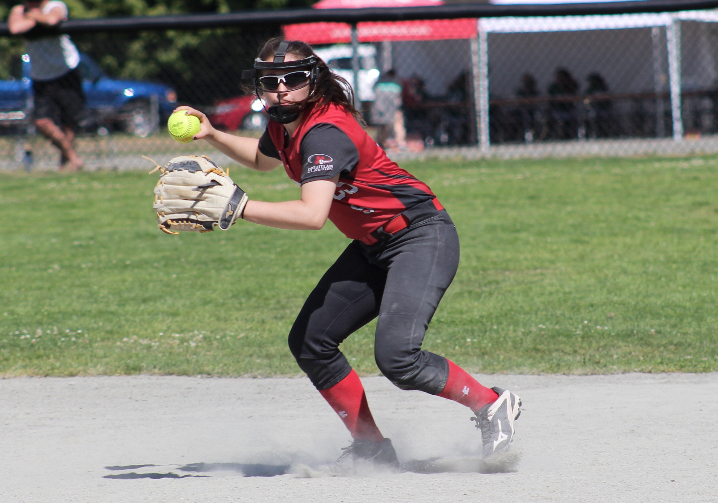 Scully also helped the Coquitlam squad capture the bronze medal in its Silver (consolation) Division at its provincial tournament this past summer in Langley, B.C. Lang knew about Scully because his daughter Hunter had played on the same team with her, representing British Columbia at the North American Indigenous Games (NAIG), which was primarily staged in Toronto in 2017. Scully and Hunter Lang helped the B.C. girls’ under-16 fastball squad capture a bronze medal at that tournament. Since the Classics were seeking a player last year, the elder Lang thought he would make a pitch to see if Scully would be interested in joining his club. “I already knew how she played and that she’d make our team easily,” he said. Lang said leaving home in the middle of a school year to join the Classics was a tough choice for Scully to make. Lang also believes Scully will fare well at the post-secondary level in Calgary. Scully is a versatile player. Besides being a catcher, she also plays third base or any of the outfield positions. “I’m excited to be a part of this team,” she said of her decision to join the Dinos. The Calgary club placed third at its national tournament this past season. Scully realizes she, in all likelihood, will not have an immediate impact with the squad. Prior to heading off to university, however, Scully will return to the Classics for its 2019 campaign. She’ll make some trips to Coquitlam to participate in tournaments with the club and then play more frequently for the Classics after her school year is complete. Scully is also hoping to crack the B.C. under-19 club that will compete at the 2020 NAIG. Those Games will be held in Halifax.